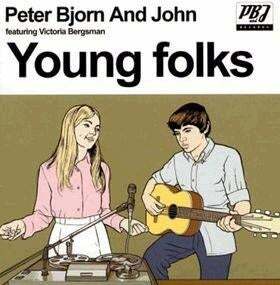 I can't post videos with my phone, so imagine Peter,Bjorn & John's "Young Folks" in your head while you read. Anyways, I am finding myself hanging with a younger crowd than usual. It is both an interesting chance to tap into the minds of youth and perhaps offer some perspective as an older person.It is also exhausting and eye-rollingly frustrating. These kids have a lot of energy. It's great to see, but at my level of fitness and weight, it's hard to keep up. Also, so much is put into socializing, so introverted me really needs to make an effort just to seem sociable. And that's another thing... There is an element of cliquishness that has been hard for me to penetrate. I've no longer been asked to clubs or just drinking out, and that kind of stings.A part of me thinks that my appearance, which doesn't fit the youthful mold of thin and preppy, has a little to do with it.Also, I've admittedly shown some snobbery by shunning Twilight and High School Musical vocally, so there is a chance that I am perceived as a bit prissy on that regard. There are some people I know who are around my age, but they are more aligned with the larger group.I wish to get to know them more outside of the larger group. We could bond on some things way more than the young folks, because it's hard being young but older.